Most of my students remember that the answer to an addition problem is a sum. Most of them even remember that the answer to a subtraction problem is the difference. Not all of them remember that the answer to a multiplication problem is the product. They certainly don't remember that the answer to a division problem is the quotient because we just started multiplication (and in so doing, have begun division when writing the "fact family"). So today I typed the four answer vocabulary words with simple phrases for our Math journals. 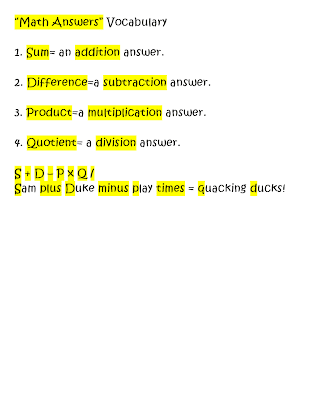 Then underneath I wrote S + D - P x Q / (couldn't type the division sign with a hypen and two dots), made a silly sentence, and highlighted the letters and corresponding words to reinforce my silliness. I am not sure if this will help all my students remember, but some of them seemed to get it. 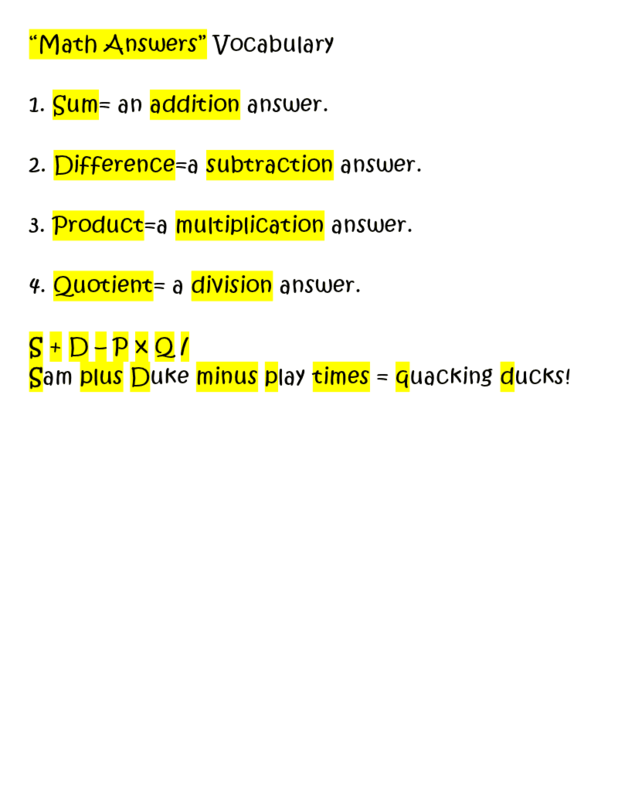 I had written Sam + Duke - play times = quirky dogs, but my teamie said, "Why not quacking ducks? If my bunch doesn't get recess, they sure do "quack" about it!" I loved it, her students will remember that, and I changed it for my students, explaining to them about my teamie's "quacking ducks."